I waited until almost the last minute to put together the menu for Christmas and then I did the same thing again for New Years Eve. Usually I have this kind of stuff planned weeks in advance, but I just didn’t get around to it this year. I think almost everyone has attended a party where one of the appetizers was meatballs in the crock pot with grape jelly. I think I am one of the few people left on the planet who has never tried this. I debated on making it for an appetizer on Christmas, but I’m just not a fan of grape jelly so I got the idea into my head that maybe I could use a different type of sauce instead. Like cranberry sauce since I still had half a batch in the freezer from Thanksgiving. Then I found this recipe by Nicole of Prevention RD. 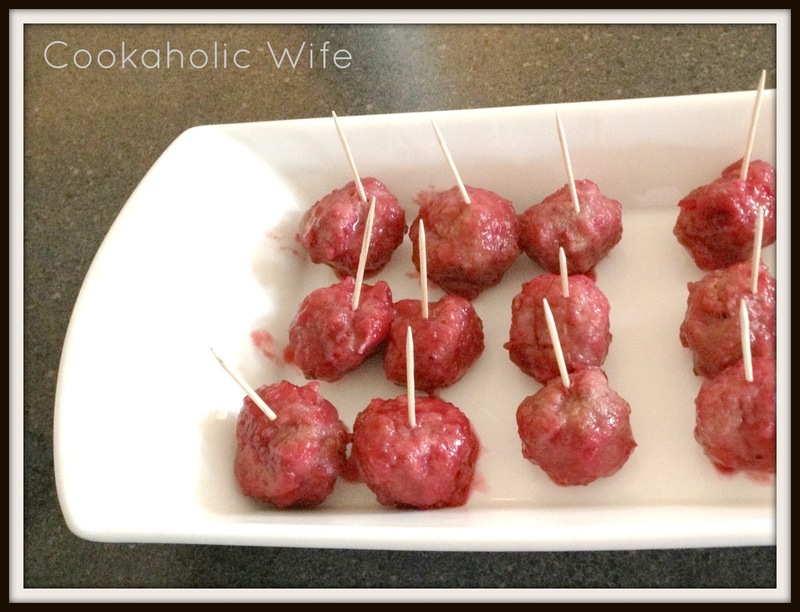 Turkey (meatballs) + cranberry sauce! What could be a better combination? 1. Preheat the oven to 375. Line two baking sheets with foil and place wire racks on top. Spray with non-stick cooking spray. 2. Combine all the ingredients except for the cranberry sauce together into a large bowl. Mix well using your hands. 3. Form into 1″ meatballs and place on the prepared baking sheets. 4. Bake for 20 minutes or until cooked through. 5. Place the cooked meatballs in a 4 quart slow cooker. Pour the cranberry sauce over them and stir to coat. If cranberry sauce is cold, heat on low for 2 hours. If sauce is warmed, set crock pot to “keep warm” setting. Meatballs can be made and refrigerated for 2 days in advance. Sauce can be frozen for 1 month. These were gobbled up incredibly quickly. My mom, who refuses to eat turkey in any form other than sliced from an actual turkey even liked these.